Columnstore indexes were first released with SQL server 2012 and have now gained a shiny new polish with the release of SQL server 2014. MSDN claims an increase of performance of up to 10 times can be gained by using column store indexes. But what are they and how are they better? The frequent analogy used for explaining clustered index is a dictionary. In a dictionary, all entries are sorted by name, so if to look-up the meaning of a word, one can just flip directly to that alphabet’s block and find the entry. In this case the data is actually stored sorted. A non-clustered index, on the other hand, can be explained by taking example of a glossary at the back of a book. In the glossary, the topics are listed alphabetically, but once you find the topic name in the glossary, you get the page number of the topic, not the actual content of that topic. You then have to flip to that page to read about that topic. In this case, the data (topics in the book) are not physically sorted alphabetically by topic. But the focus here is on storage. If we had to make our own SQL server for the above scenarios, the first question would be how to store all the categories, catalogs, books, and contact numbers. Ultimately, all data that is stored on a computer, is stored as bits. This applies to SQL server data and indexes also. SQL server uses 8KB pages to store data, indexes, and other metadata. These pages are then grouped into buckets by SQL server, which are known as Extents. Each extent contains eight contiguous pages, picked from all the pages of the database numbered from 0 to n.
So SQL server first divides a table into groups of rows, then stores each rowgroup in the columnar format, with a single column per page. The single column can then be compressed (since columns generally contain similar values for multiple rows), to reduce the input/output operations needed. Also, this can improve performance if the query only frequently needs some columns of the table. The number of pages that need to be read to get the desired data decreases. However, if a select query is fired that fetches all columns, the number of pages accessed would increase. SQL server also stores some rows in rowstore format to improve performance. This temporary rowstore is called deltastore. Both, deltastore and rowgroups and can be checked using system table sys.column_store_row_groups. Now, all rows are compressed in a single rowgroups with size 1513360 bytes. 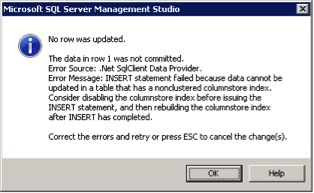 Non-clustered columnstore index is still not updateable in SQL server 2014. Though columnstore indexes can compress data to improve performance and also work faster when only few columns in a large dataset need to be fetched, they also come with certain limitations. For some scenarios, the deltastore, compression, and decompression can actually add an overhead. Columnstore indexes do not work well with outer join, not in conditions, union all etc. 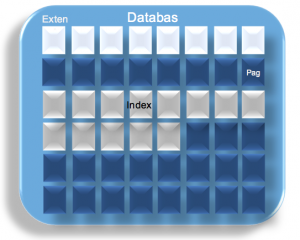 on the columns of the table with a columnstore index. These indexes work best with queries that support batch processing of data. For other queries also, performance may be better due to reduced I/O. So, as with any other question related to SQL server performance tuning, this question of whether to use columnstore indexes or not can also be answered by saying “it depends”. However, it is important to understand how these indexes work internally to be able to make the right decision. In this blog, I have covered the basics of how columnstore indexes work internally. Please feel free to add your questions, comments, and suggestions below on any of the points covered above. Meenakshi Kumar is a Lead .NET Developer at 3Pillar Global, where she has spent the past 5 years writing code to develop faster and easier-to-use technologies and interfaces. When not writing code, she spends her time expanding her technical knowledge. I am wondering if replacing the above index with a Clustered ColumnStore Index would improve overall performance. I’m not sure if our infrastructure would be able to handle the 1.5 billion records in memory. Would you please provide feedback?